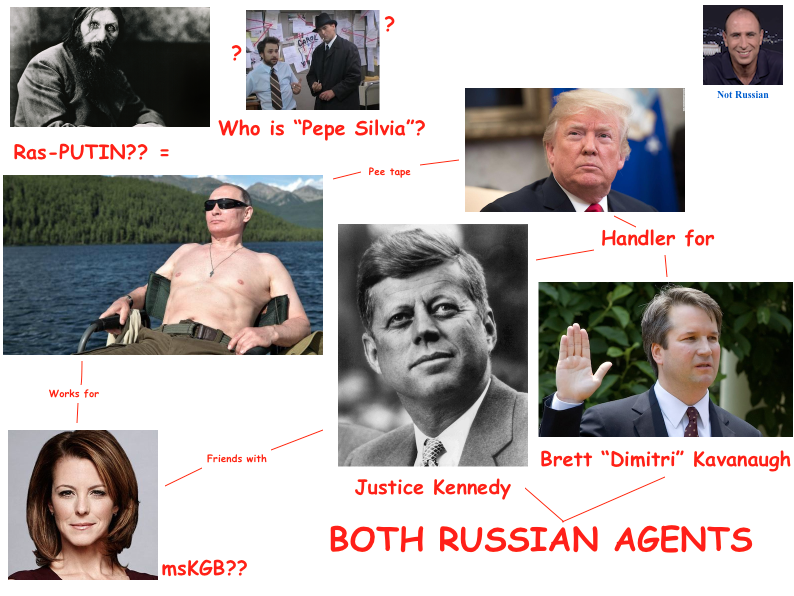 Has Brett Kavanaugh Been a Russian Agent Since 1987? I hope you're are buckled in, because I'm about to blow your f***ing minds. We know this because of a tweet sent by NBC reporter Leigh Ann Caldwell claiming that "Kennedy and Trump/WH had been in negotiations for months over Kennedy’s replacement. 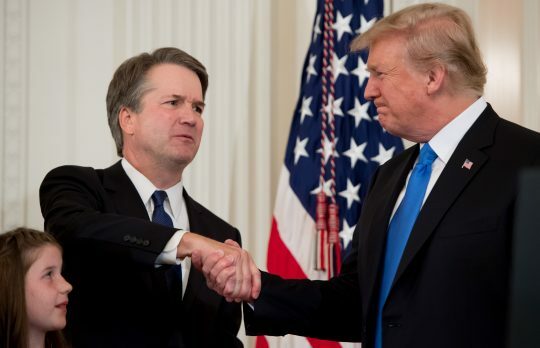 Once Kennedy received assurances that it would be Kavanaugh, his former law clerk, Kennedy felt comfortable retiring." Now naysayers might point out that Caldwell immediately followed up by indicating that she "[doesn't] have any info on whether [Trump] talked to [Kennedy]" and was citing only one source. Or that she went back and deleted the tweet and said there was no "transactional nature" to Kennedy's discussions with the White House and that Kennedy listed a bunch of judges, not just Kavanaugh. Those naysayers, I hope to prove, work for Putin. But let's take a slight detour first. Center for American Progress president Neera Tanden blew this one wide open back in June. The quid pro quo here is obvious. First, the Kennedys provided Donald Trump with a $1 billion loan. In return for that favor, the Kennedys also ruled in Trump's favor in exchange for nothing. Rather deviously, Kennedy also ruled in favor of the Trump administration on cases where his past rulings strongly suggest he would've done so anyway. It makes too much sense NOT to be true. The MSNBC host immediately threw cold water on Tanden's theory at the time, citing her previous work with Justin Kennedy at Deutsche Bank (note: "Deutsche" is German for "Russian") and claiming he didn't have anything to do with the Trump loan. Again, thank you to Neera Tanden for this insight, based on a tweet from an NBC reporter that was based on a tweet that has now been deleted. That's when Trump got his first Deutsche Bank loan. "What If Trump Has Been a Russian Asset Since 1987?" Jonathan Chait wrote for New York Magazine Monday. In a whopping 8,000 words, Chait lays out the case that, maybe, one day, hypothetically, you never know, there might be evidence indicating that, perhaps, there's a chance Trump has been a Russian agent dating back to 1987, possibly. Chait notes that Trump began railing against the U.S. providing security to nations like Japan in return for no compensation in 1987. He briefly entertained the notion that Trump's showy entrance into politics and attacking America's "bad deals" might somehow be related to the 1987 release of The Art of the Deal. But Chait notes Trump was talking about Japan two months before The Art of the Deal was released, and surely no one has ever sought publicity or had an idea before a book release. I can see no flaws in this logic. The safest assumption is this is false. It seems slightly insane to say it's true. But if there's at least a 10 percent chance this is true, shouldn't we be discussing it? I understand this may be confusing to some. So I've decided to make a chart. I know what you're thinking: "Alex, isn't this all a bit speculative?" Well, what's the alternative? That multiple reporters and respectable center-left pundits have fallen prey to absurd, unproved conspiracy theories about President Donald Trump as a result of the impotence and frustration they feel at an inability to curb his policy and Supreme Court picks? Personally, I find that hard to swallow. This entry was posted in Politics and tagged Brett Kavanaugh, Parody, Russia, Satire. Bookmark the permalink.